Even though sous vide steak recipes are very prevalent it's hard not to write about them in summer because I spend so much time outside grilling. I also love the convenience of sous vide steak. I can toss a pouch into the water bath and whenever we're ready to eat later in the day I can pull it out and quickly sear it on the grill. It's great for lunches as well since it reduces the time I'm cooking. I can now have good meals during the day without being in the kitchen for too long. Here I decided to go for a rib steak since I had several in the freezer. One was already seasoned with garlic and onion powder, as well as a little paprika for a slight smokey flavor. I took it out of the freezer and put it directly into the water bath at 131°F / 55°C. Since it's frozen it takes about an extra hour but rib steaks have such a large time range (2 to 8 hours) and I wasn't planning on eating right away so it didn't really make a difference with the timing. I had some oyster mushrooms around so I sauteed them with garlic and butter. I also put together some guacamole to serve with the steak since I love the flavor of avocado with beef. To finish it off I grilled some squash from the garden while the steaks were being seared. For more sous vide recipes and tips you can get our books: Sous Vide Grilling or our comprehensive Beginning Sous Vide book. We also have many more cooking times available on our iPhone and Android App and sous vide thickness iPhone app. Preheat the water bath to 131°F / 55°C. Salt and pepper the rib steaks and sprinkle with the garlic, onion, and paprika. Place the rib steaks in the sous vide pouch and seal. Place in the water bath and cook the sous vide rib steak for 2 to 8 hours. To make the guacamole simply combine all of the ingredients and mix well. Salt and pepper to taste. For the mushrooms, melt the butter in a pan over medium-high heat. Add the garlic and cook for 1 minute. Add the mushrooms and cook until tender, stirring once or twice. Drizzle the zucchini slices with the olive oil and garlic powder then salt and pepper them. Take the steaks out of the pouches and pat dry. Cook the zucchini on the grill for until it becomes tender, about 5 or 10 minutes. When the zucchini is almost done sear the steaks on the grill for 1 to 2 minutes per side. 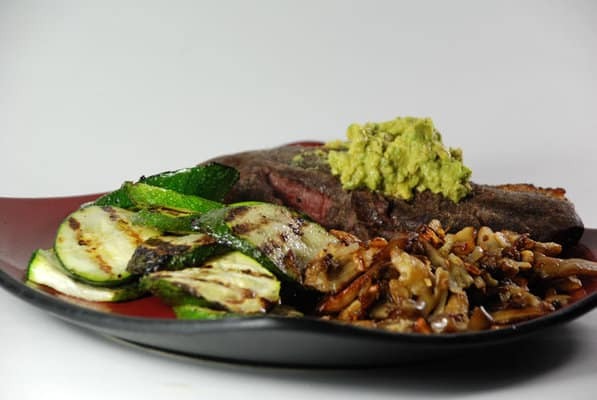 Remove the steaks and the zucchini from the grill and serve with the guacamole on top of the steak. ©Primolicious LLC. 2017 All Rights Reserved for Modernist Cooking Made Easy.